I could hear the defeat in Andrea’s voice. “So, tell me again what he told you?” I asked. The “he” in our story is Andrea’s Uncle Frank. To Uncle Frank’s credit, he was following her business growth with rapt attention. He loves his niece and wants her to do well. So, his opinion was not entirely without heart. But the advice hurt, especially since Andrea had put a lot of focused time into her new website. “He works in a bank,” she replied. Unfortunately, Andrea’s is not an uncommon situation. When people are first starting a business, or when they’re in an uncomfortable transition in their business, there’s bound to be uncertainty. This can make them feel vulnerable. In that state, they might open themselves up to well-meaning advice, and end up blind-sided. In other words, when it comes to business advice, you must consider the source. In other words, is s/he more successful than you? And yes, in the context of business, that measurement is money. I can speak from experience here when I say that it takes a radically different mindset and skillset to run a $100K business than it does a $500K business. And it takes a radically different mindset and skillset to run a $1M business than it does a $500K business. Someone who understands the layers involved in marketing, systems, team – and also has the compassion to understand the growing pains involved in the Upleveling process is more likely to offer advice you can follow, as opposed to blanket criticisms that offer no solutions. Money, of course, is not the only measure. I’ve received advice from people who have made millions which is an amazing accomplishment of course. But if they don’t have an awareness of spirit, purpose, compassion, service and lifestyle, then they’re not my ideal adviser. Congruence means that the person who is advising you approaches their business with the same core values and standards that you live by. Get clear on what those are! This is a big one, and it could save you lots of heartache. When you’re asking for advice, make sure that you’re clear about exactly what you want to know. Be armed with precise questions. In other words, does this person WANT to give advice? Or are they reluctant to take the time or give the needed focus to really listen to your question? The answers to these questions can reveal the quality of advice you’ll receive. Some people are just too busy or impatient to take the time to hear you out. What often happens in a case like this is that the advice is not solution-based. It’s merely an opinion! The advice has to be in context with the challenge you’re facing, results you’re seeking or question you’re asking. Too often, I’ll hear from someone who has received some criticism on her weight or hair from someone who is supposedly advising her on her business operations. An understanding of your ideal client. A grasp of the results you’re aiming for. Honoring and valuing the level you are at in your business. One day, many years ago, I almost gave up everything I had worked for in my music career based on one single piece of advice I got over the phone. Who gave me this advice? 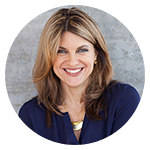 A best-selling author who had a “call in coaching” day. Even though one or two of the criteria above may have fit, this person had never even heard my music or seen me perform. The problems I was having were about the HOW of my business, not the WHAT of my business. But there’s no way she could’ve seen that. 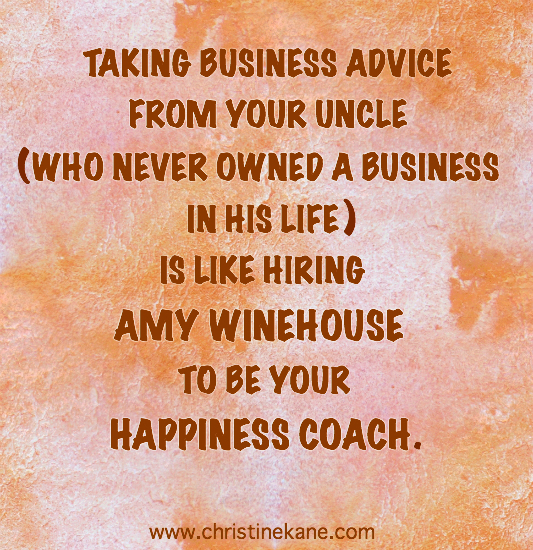 Thank goodness I checked in with my business coach about this person’s advice. Do you have a personal example? What kind of bad business advice have you gotten? And what did you do to deal with it or get clarity about it? What standards did you create? Ouch! Christine! The Amy Winehouse thing: not nice, especially considering she paid the ultimate price for her issues. Love you, but this is the only time I’ve been disappointed in something you’ve said. It doesn’t even sound like you! Thanks for your thoughts here Elizabeth! Thing is: this is exactly what I said to my client. I said it to hit a point home hard. I too loved Amy Winehouse and her music and her art, and was saddened at the loss of such a voice. (Just as my client loved her uncle’s brilliance in the banking world.) This is not a statement about people themselves or even about my client’s uncle. it’s merely a way of saying, be clear about who you hire. And if my perspective/humor bothers you, I totally respect that. Yes, you are so right about this. I have noticed that l pay more attention to who l share my ideas with, than l did before. I used to tell everyone about my big plans and ideas and l guess l thought that if l get many “yay, go for it!” From various people it would somehow verify that my idea was great. What a wrong way to go about it! And so annoying to listen to people giving you advice on why you should stop what you are doing, when you can hear that they are trying to convince themselves that their own decision to not follow their dream, was a good thing. So now l am more aware of how l share ideas and with whom and it makes a huge difference. I protect my embryos from others expectations of them growing sooner than they can. And l let people in to give the growth a push when it is needed. It really comes down to trusting my intuition, believeing in the very core of my idea and being willing to tweak my ways of bringing it forth in a fuller way. This is a great environment for that, thanks! Thanks, Christine, for being such a strong and generous guide! Oh, this is hard to say, but… my instinct told me in 2004 to move out and sell my house. My Mother insisted I hold onto the house, because “houses are your best investment and you might need the money from your equity one day”. She also said if I was having trouble with the payments, they’d help me keep my house (I was at the time unemployed). Did my Mother ever own a house or pay a mortgage? No. Dad did all that, and she remained blithely oblivious to all things financially-related even after he died (and then I became “Dad” until she passed four months later). She never even had a full-time job with benefits; she was a very blessed stay-at-home mom/substitute teacher/faculty dame and had no clue what it was like to be a single working woman with a mortgage. Wonderful woman, terrible advice, bad choice to take that over my gut instinct. When I started out as a consulting chemist in 2000, contradictory advice seemed to be everywhere. The main obstacle was that, while consulting chemists are quite common in the US, in Germany, where I live, they were rare birds indeed – maybe 500 in a country of over 80 million inhabitants – so there were no business models. The worst piece of advice I took was to copy the structure of an engineering office, services and fee structure included. Don’t ask… Only after I found a way to market the services I really could do, and which I was told nobody wanted, the business took off. Especially around marketing there is as much contradictory advice as there are book authors. One tells you to cold call, as there is no other way to really initiate a contact, others tell you never to cold call because you endanger your status as an expert. One author tells freelancers to decorate themselves with all the trappings of a “real” company (in areas where freelancers are unusual, that is, in Germany, in allmost all areas), others tell you to never pretend to be something you are not. In the end I had to go by gut feeling and my own experiences. As I hate to be where I’m not wanted and am too weak-kneed to lie, I stuck to a no-cold-calling and rather open way of presenting myself. And that was lucky, because it is incredible how many people come to know you after a few years… if I had put on any kind of pretence the bubble would have burst by now. I know that negativity is undesired here, but I have to mention that I got some advice at least that was motivated by envy and not by benevolence. Claudia — I think you bring up an important point. “Considering the source” means that you have to make sure you’re talking to someone who is holding the space for you to be BIG. They don’t want you to shrink whether it’s due to their own envy, fear, security issues or whatever. The ones who can really hold that big space for you and offer the best solutions are almost always the ones who have DONE IT, are LIVING IT, and are CHEERING for your success! Congrats on being true to yourself! Wow, thanks for this post, Christine. I just had a recent bad experience with such. I think unsolicited advice is the worst kind. And most difficult for me is the financial advice of my adult children. They are successful and lovely people in their chosen fields, but none have operated a business or reached the age when they understand how important it is to follow your dreams. The recent episode involved a very financially successful daughter who, when I was in an off season (I have a landscaping business), urgently counselled me to please go back and get a real job with benefits. The conversation degenerated to how much she mistrusted all my financial advisors, despite the fact that they are some of the best and most reputable in their fields. This kind of advice hurts and can damage our confidence and our family relationships if we let it. It’s taken me a while, but I have regained my mojo. Partly by understanding that such advice by family is often generated from genuine concern, and partly by realizing that they are so young and in-experienced. At any rate, the newsletter topic was very helpful to me. Over the past few years, I’ve learned to be more intentional about who I ask for advice. As a part of that effort, I’ve reached out to local business women and established a mastermind group. We now meet once a month and keep in touch between meetings through a private Facebook group. These women understand what I’m trying to accomplish and have a mix of skills and experiences. When I get advice that doesn’t quite feel right, I can always bring it to this group for a reality check. They help keep me sane and give me a bit of perspective. Awesome Erica! A high level of accountability and support are so necessary! Fortunately, I was in a fierce stage of art making. I felt confident about my work, though even then, I knew it wasn’t for everyone. I was puzzled by the feedback, but thanked her for her time and moved on. And two years later, the same gallery manager was begging me to carry my work. Quite gratifying! Over the years, I’ve had some ups and downs. Finding my audience is always a challenge (though the internet is helping a lot!) But whenever I find myself feeling too down, I remember how wrong that woman was. And my friend still teases me from time to time about my “immature aesthetic”–in a nice way! You are spot on, Christine, in your advice. Consider the source. Find better support and feedback. You’ll know you’re hearing the right advice when your heart leaps forward to meet it. When I was in college and soon after – many, well-meaning people told me when they found out that I was an aspiring artist that I should “marry a rich man” – as if they grow on trees, and as if that should be my sole criteria for a mate, as if that is really going to be a good source of income (50% divorce rate) and perhaps worst of all – as if I would never be able to sell my work or enough of it to support myself as an artist. What is scary is that that now that I’m in my 40’s and teach part-time to aspiring artists – find many young women are still getting that bad advice. I had hoped that our culture had evolved beyond the 1950’s…. What a strange piece of advice… to marry rich. When I was living in this paradigm, I got very clear that I wanted to BE rich myself and then marry who I wanted. And I know many many successful artists who, while not necessarily RICH by american standards, are so freakin’ HAPPY that you wonder how this advice is still so predominant. Super proud of you Melissa! Keep modelling the dream! People need you! I get stuck o the “business advisors” or well meaning Chamber of Commerce agents that don’t understand scale or growth, and how that changes the way things need to be done. It is very different running a $1.7M business with 15 staff than it was running a $1M business with 10 staff. A whole new layer and complexity is created when you get over 10 staff, and yet to many advisors, these are both just “small” businesses. Also, the differences between having governmental agencies as clients vs. individuals or small businesses. A lot of the time the processes are the same, but the level of interaction, paperwork, and time management is very different. Aside from working with you and your Uplevel process, Christine, to keep my mind, ego, and inspiration in check, I’m having a very hard time finding business advisors who “get it”. I guess it’s because i have a “niche” business and the are just not many like it, but if often feels like I have “to make it all up”. Your checklist of “who to trust” is helpful. Okay Teresa — I may not have read your comment correctly — but my biggest question is this: If you have a $1.7M business (congrats on that!) — what on earth are you doing getting advice from chamber of commerce folks? (Nothing against them, but at this level you are thinking and achieving WAY bigger than most people and need to get supported at a VERY high level!) Again, i may have read this wrong… but it sounds like it’s time for you to stretch into a very high level coach! Daisy – Yes, I’ve seen many cases of coaches trying to box someone into “what will work” (in their eyes of tactics) vs “what is your core message and who are you?” And good for you for finding your voice and your ideal client! My careers advisor from school (who I only met once and he didn’t know me) told me that I should go and work in a library!! I’m so glad for everyone that I didn’t follow his advice! Do You Take “All or Nothing” to the Extreme?